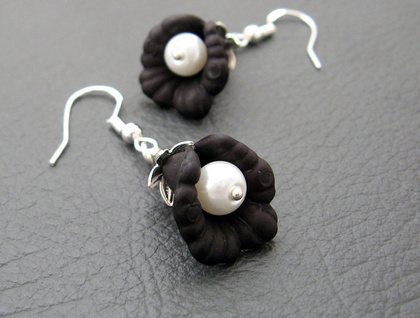 These night-blooming flowers are made of black acrylic, and their centres are formed by white glass pearls. 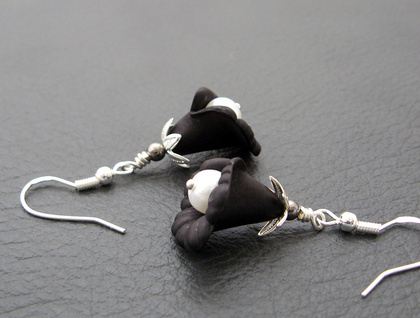 Each flower is topped off by a leafy, silver-plated cap, and a small, gunmetal-black bead. They are designed so that, when worn, the lowest-hanging part of the blossoms will sweep down and away from the wearer's face. 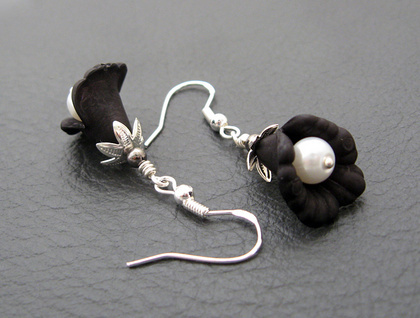 The ear hooks are made of sterling silver, which is naturally hypoallergenic. They are stamped '925', which means that they are at least 92.5 percent pure silver (the definition of sterling silver). 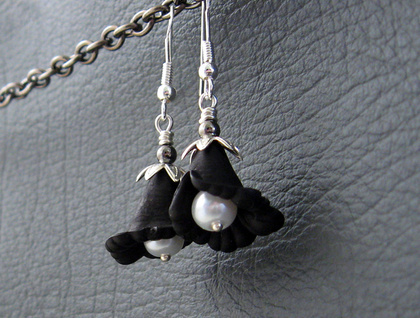 The 'Midnight Bloom' earrings are lightweight and easy to wear. They measure 41mm from top to bottom, 24mm long from the bottom of the ear hooks, and 16mm across at their widest point. They come with little, removable plastic stoppers to help prevent the hooks from working their way out of the wearer's ears.